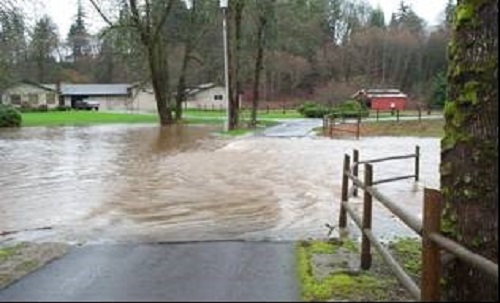 HSPF Flood Insurance Study for Clark County (WA) | WEST Consultants, Inc.
A FEMA Flood Insurance Study was conducted along 116 stream miles of 20 streams in Clark County, in the vicinity of Vancouver, WA. A hydrologic analysis was performed as part of the study which included the review of an existing HSPF Model of the Salmon Creek basin. Ground surveys were conducted using a combination of the latest GPS and Optical Total Station equipment for all of the channel cross-sections and hydraulic structures. This allowed for all of the survey data to be quickly and easily geo-referenced to existing National Geodetic Survey (NGS) monuments, resulting in easy integration with recently acquired digital 2-foot contour mapping and aerial orthophotography. HEC-RAS 3.1 was used to perform the hydraulic analysis which included levees, inline weirs, bridges, and culverts, as well as multiple separate overbank (split-flow) reaches. Water surface profiles for the 10-, 50-, 100-, and 500-year flow events as well as the 100-year floodway were determined. All geometry data within the hydraulic model maintained its geo-referencing so that the output data could be post-processed using automated mapping and display techniques in ArcView GIS. After thorough in-house and FEMA review, the submitted digital floodplain and floodway maps were used as a basis for new Digital Flood Insurance Rate Maps (DFIRMs) for Clark County, WA.